Breaking free carries with it fear of loss — loss of safety and, worse, loss of our own identity. Fear keeps us holding on to familiar patterns, comfortable surroundings, and convenient ideas. By removing the obstacles of the familiar, the desert is the quintessential symbol of transformation and renewal. Desert is the slate wiped clean, the original empty space from which Creation emerges. In the desert, we fight the gravitational pull of the past and the allure of enslavement with its illusion of safety and comfort. This is the moment of the Exodus story that I’ve attempted to capture — the state of mind that is the desert. Professional Background Anya Roz was born in Moscow into a family of artists. 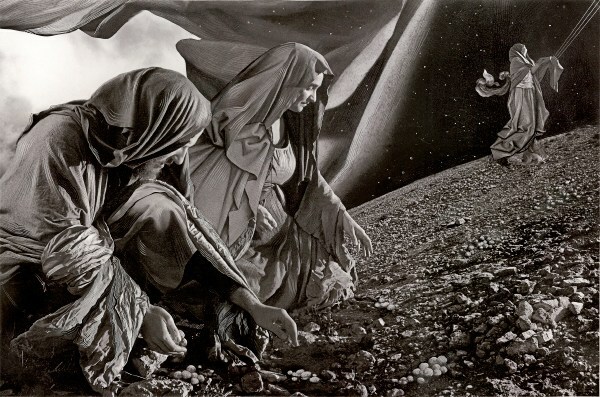 Her works, based on biblical texts and inspired by European painting, re-imagine the ancestral Jewish story through a blend of canonical imagery and contemporary digital photography. Roz studied art in Moscow and New York, and received her MS degree in design from the Pratt Institute, New York City.